Looking for a Used S7 in your area? CarGurus has 195 nationwide S7 listings starting at $27,975. Entering its second year of production, the Audi S7 5-door coupe receives a few minor updates for 2014, including new standard and optional features. Leather armrests and a Side Assist blind-spot alert system now come standard on the 2014 S7, while new options include a Black Optic exterior package and layered aluminum and black wood interior decorative inlays. In addition, Audi adds a corner-view camera to the optional Driver Assistance Plus package. One of the newest vehicles in Audi's model lineup, the S7 joins a growing class of vehicles referred to as 5-door coupes, due to their coupe-like exterior profiles with tapering rooflines, as well as their 4 side doors and rear tailgate. The S7 and competitive 5-door coupes like the Mercedes-Benz CLS-Class, the Porsche Panamera and the new BMW 6 Series Gran Coupe offer buyers a certain level of functionality and family friendliness while retaining performance-oriented characteristics, giving buyers the best of both worlds. The S7 occupies something of a middle ground in Audi's lineup, situated between the lower-end A7, on which it's based, and the high-end track-tested RS 7. As a result, the S7 delivers a potent combination of styling, performance, handling and interior comfort, as well as functionality and fuel efficiency. Equipped with a relatively new twin-turbo V8, the S7 zips from 0-60 in just 4.5 seconds and includes such standard features as Audi's quattro all-wheel-drive (AWD) system and a rear sport differential, ensuring optimal handling and stability. An attractive exterior design and comfortable upscale cabin equipped with leather upholstery, a navigation system and a 14-speaker Bose audio system, among other standard features, add to its overall appeal. The S7 also delivers the functionality that comes with a rear tailgate and good fuel economy numbers for its class. The S7 shares its DNA with both the A7 5-door coupe and the S6 sedan. Specifically, it borrows its body style and exterior design from the A7, while the suspension and interior components come from the S6. Starting outside and working in, the S7 displays a sporty, windswept profile, with a long hood, distinctive side creases, pronounced wheel wells and a low roofline that tapers to the power-operated tailgate and quad chrome tailpipes at the rear. The aggressive front end features a platinum gray matte Singleframe grille and lower air intakes with black honeycomb inserts. The eyebrow-like automatic HID headlights, located above the air intakes, include an underlining of LED daytime running lights. At the rear, an adaptive rear spoiler deploys when needed, while rear foglights and LED taillights add to the S7's unique look. The Black Optic package, new for 2014, dresses up the exterior with a Black Optic grille, glossy black surrounds on the windows and 20-inch wheels with a titanium finish. Power for the S7 comes from a 4.0-liter TFSI twin-turbocharged V8, which it shares with the S6 and the S8. The V8 features a compact design and a reconfigured airflow, designed to improve efficiency and fuel economy. In the S7, the V8 generates 420 hp, compared to 310 hp from the A7's supercharged V6 and 560 hp from the RS 7's twin-turbo V8. Torque produced by the S7's V8 tops out 406 lb-ft at 1,400-5,200 rpm, which helps ensure that quick sprint to 60 mph. The V8 links to a 7-speed S tronic dual-clutch automatic transmission with a manual-shift mode and steering-wheel-mounted paddle shifters. Fuel economy numbers check in at a decent 17 mpg city/27 highway. Premium fuel is required. Audi limits the S7's top speed to 155 mph. The S7 delivers a firm yet comfortable ride, thanks to its S-specific air suspension, which features a 5-link configuration with a stabilizer bar in the front and a trapezoidal-link rear configuration with S sport calibration. The sport differential, which comes standard, actively distributes power between the rear wheels and includes torque vectoring software, which allows the differential to send varying amounts of torque to individual wheels for superior cornering and stability as the vehicle exits tight turns during aggressive maneuvers. In addition, drivers can use Audi's Drive Select system to adjust the firmness of the ride by choosing from Comfort, Dynamic, Auto and Individual settings. An electromechanical power steering system provides good responsiveness and feedback, while big 15.7-inch front brakes and 14-inch rear brakes with S7 badging provide plenty of stopping power. The S7 rides on 19-inch S-design wheels with summer performance tires. Owners can add 20-inch wheels as an option. The S7 seats 4 passengers in a 2+2 arrangement. As in traditional 2-door coupes, the roofline cuts into rear headroom, making the second row a tight fit for taller passengers, but the sloping roofline with its rear tailgate also offers a functionality not found in traditional coupes. Cargo space in the rear checks in at a generous 24.5 cubic feet, and the rear seatbacks split and fold to further expand cargo-carrying capabilities. The S7's cabin comes well-equipped with a wide range of upscale features, including Valcona leather seats with a diamond-stitched pattern, decorative inlays, ambient lighting, illuminated door sills and 12-way adjustable heated power front sport seats with driver's-side memory. The 3-spoke multifunction sport steering wheel includes a power tilt/telescopic column with memory, as well as paddle shifters. A power sunroof, 4-zone automatic climate control, Bluetooth and Audi's advanced key system are among the other standard features on the S7. High-end tech features include Audi's MMI navigation system with an 8-inch color screen, dedicated buttons, handwriting recognition, AutoPilot noise compensation and a rear-view camera. The navigation system also includes the new Audi Connect feature, which provides in-vehicle WiFi and localized weather and information. In addition, owners can use the color screen to manage the S7's 14-speaker, 630-watt Bose Surround Sound audio system, which includes HD radio, SiriusXM satellite radio, a CD player and an iPod port. Interior options include a 15-speaker, 1,300-watt Bang & Olufsen audio system, as well as the new aluminum and black decorative inlays. The S7 comes equipped with 8 standard airbags, including knee and thorax side airbags. A new Side Assist feature, bundled into the navigation system, monitors blind spots and alerts drivers of approaching vehicles, while a Pre Sense system helps reduce damage in rear-end collisions by tightening seatbelts and closing windows and the sunroof when it detects an impending crash. Electronic stability control, traction control and antilock brakes with electronic brakeforce distribution and brake assist are among the other standard safety features. An optional Driver Assistance Plus package now includes a corner-view camera. 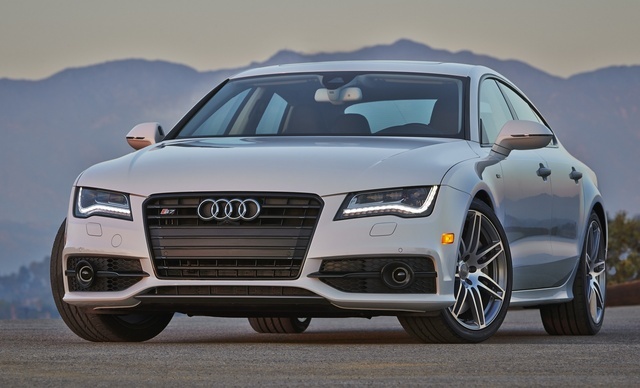 What's your take on the 2014 Audi S7? 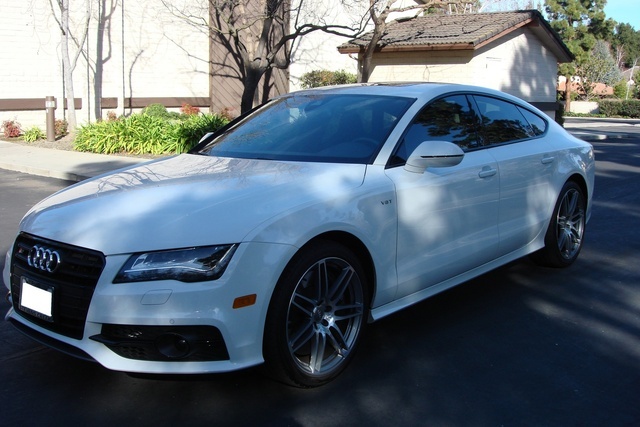 Have you driven a 2014 Audi S7?